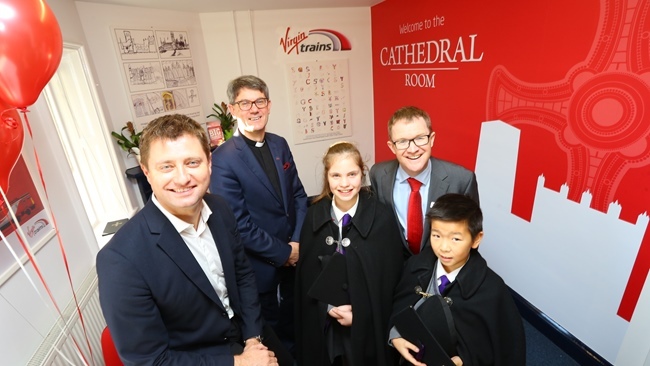 The Cathedral Room, a special community space at Durham Station provided by Virgin Trains, is now officially open. Television presenter and architect George Clarke was in Durham last week to open the room alongside the dean of Durham Cathedral, the Very Reverend Andrew Tremlett, and the managing director of Virgin Trains on its east coast route, David Horne. Also present were some of Durham Cathedral’s choristers, who enhanced the opening ceremony with song. The Cathedral Room, which has fantastic views of the cathedral, can be booked free of charge for meetings or events. The room is decorated with artwork made by participants in Durham Cathedral’s Open Treasure Learning and Outreach Programme. A short ceremony took place, during which the room was blessed. Also present were station manager Louise Rutherford, and representatives from the North East Chamber of Commerce, the County Durham Community Foundation, the Federation of Small Businesses and other organisations. The Cathedral Room currently has spaces for another four pieces of framed artwork. Durham Cathedral and Virgin Trains plan to fill them by running a competition open to young people aged 5-18. Submissions must be on a piece of A4 paper and the four winners will be chosen by a panel of judges from Durham Cathedral and Virgin Trains’ design team. An overall winner will be picked by George Clarke. Full details can be found at www.durhamcathedral.co.uk. The Cathedral Room is now available for community groups to book for small events and meetings. Those wishing to book the room should speak to staff at Durham Station.